Mr. Hwang-keun Chung was appointed as the new administrator of Korea’s Rural Development Administration (RDA) on 17 August, succeeding Mr. Yang-Ho Lee. Mr. Chung has a B.A. in Agriculture from Seoul National University and has served as the deputy director of the Agriculture Policy Division, Ministry of Agriculture and Fisheries; director general of both the Rural Policy Bureau and Agricultural Policy Bureau under the Ministry of Food, Agriculture, Forestry, and Fisheries; and secretary to the President for Agriculture, Livestock, and Food. Mr. Chung will continue to pursue all opportunities to strengthen the collaborative relationship between RDA and the International Rice Research Institute (IRRI), according to Dr. Jeom-ho Lee, director, International Technology Cooperation Center, RDA. The Government of the Republic of Korea has been collaborating with IRRI through the RDA since the 1960s. The research partnership includes rice breeding using temperate japonica rice varieties and tropical indica varieties as parents. This produced the rice variety Tongil, which transformed the country from a rice importer to a self-sufficient producer. 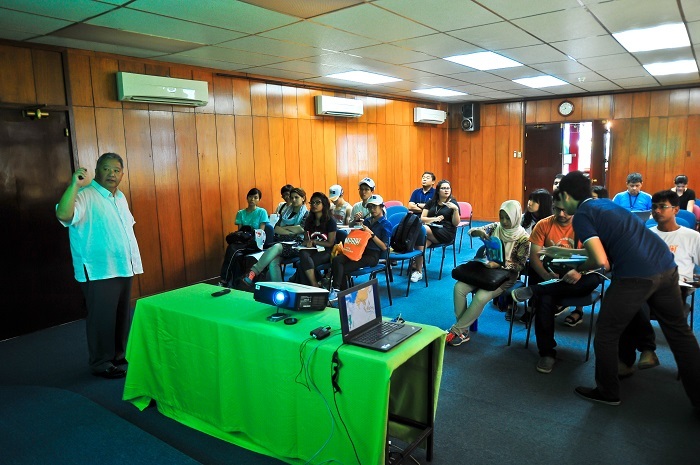 LOS BAÑOS, Philippines—A delegation from the 2nd Asia-Pacific Youth Exchange (APYE) visited the International Rice Research Institute (IRRI) on 5 August to get an overview of current research activities aimed at ending global hunger and ensuring sustainable rice production. The 20-person delegation was introduced to IRRI’s initiatives toward meeting the United Nations’ sustainable development goals (SGD) on hunger and responsible food consumption and production. The APYE delegates were briefed by Dr. Bruce Tolentino, deputy director for Communication and Partnerships; Dr. Rosa Paula Cuevas, a scientist at IRRI’s Grain Quality and Nutrition Center; and Dr. Maricar Alberto, climate change expert. The program is designed to aid in formulating solutions that will ease the problem of labor shortages that are affecting food production as well as unemployment among youth. 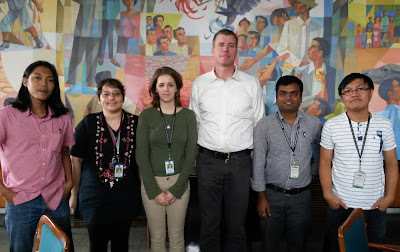 LOS BAÑOS, Philippines, 11 August—The Young Researchers' Lunch recently hosted John McKay (center in photo), associate professor of plant genetics at Colorado State University. Dr. McKay, who is at IRRI to serve as a resource person for the ongoing 2016 Rice Research to Production Course, is also the principal investigator at The McKay Lab. His research interest is to gain an understanding of the traits and genes of plants involved in adaptation to particular stresses such as drought. The group discussed making comparisons between working with model plant species such as Arabidopsis spp. and crops such as rice. Dr. McKay also provided some perspectives on the current funding situation at U.S. universities that affects the enrollment of potential graduate students. 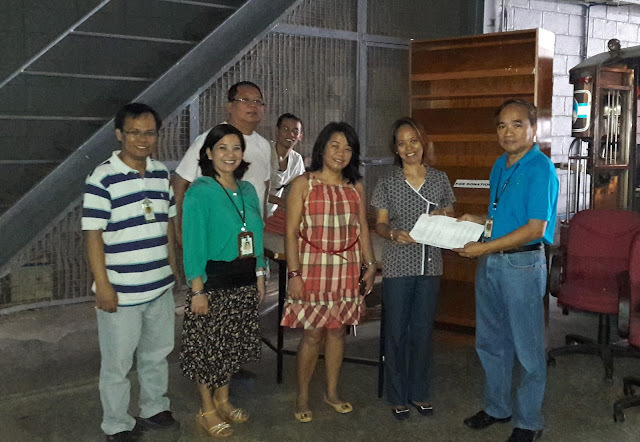 LOS BAÑOS, Philippines—IRRI, through the Society of IRRI Non-research Professionals (SINOP), has donated cabinets, tables, and chairs for the Eva Corazon Library of the Bagong Silang Elementary School (BSES). Ms. Corazon is SINoP’s late former president. “After our back-to-school activity to bring books and inaugurate the library in June, we noticed that the furniture and fixtures at the library were already dilapidated,” said Miriam Telosa, SINOP president. “They needed new ones to secure and safeguard the books and materials that were given to them. SINOP endorsed the donation to Dr. Bruce Tolentino, IRRI's deputy director general for Communication and Partnerships, who supported and approved request. “These donations will also help the students enjoy using their library and enhance their learning experience,” Telosa added. Ms. Romelda de Jose, BSES principal, received the donations from Mr. Lito Platon, IRRI’s Community Project officer, during a turnover ceremony on 28 July. Members of the organization attended the turnover ceremony (photo)..
BSES is an adopted school of SINoP and some of its deserving students are supported by its scholarship program. Dr. Paul Marcotte (at right in photo), who headed the Training Center of the International Rice Research Institute (IRRI) at the turn of the century, passed away unexpectedly on Sunday (7 August) in Parkdale, Oregon, 3 weeks short of his 70th birthday. He died peacefully in his sleep after a weekend full of fun and adventure on the farm in Parkdale and cycling in the Columbia Gorge with family and friends—his favorite retirement activities. In the photo, taken at IRRI in 2000, Marcotte confers on delivering new rice technology to farmers with Mark Bell, then head of IRRI’s International Programs Management Office. In 2000-02, Marcotte began a revolutionary effort to revitalize and streamline IRRI’s Training Center. He led the development of a strategic plan for the institute's training activities, which conceptualized the Knowledge Pathways Initiative. This resulted in the harnessing of new modes of delivery for training materials in the digital age—ultimately leading to today’s Rice Knowledge Bank. Marcotte, who worked at the University of California, Davis, from 1994 to 2011, had a masters degree in agricultural economics from Texas A&M University and a PhD in rural sociology and international development from the University of Kentucky. At U.C. Davis, he taught in the International Agriculture Development (IAD) and Community Development (CD) programs, directed international programs, and was an academic administrator for both the Chancellor’s Office of University Outreach and International Programs and the Dean’s Office of the College of Agricultural and Environmental Sciences. He had been selected as “Teacher of the Year” for both the IAD and CD programs. While at U.C. Davis, he was also the chair and vice chair of the IAD Graduate Group, director of the Humphrey Fellows Program, and director of the Indian TNAU/UC Davis Scientific Exchange Program. In addition to his work at U.C. Davis and time at IRRI (2000-02 and 2004), Marcotte was a U.S. Peace Corps volunteer in Thailand, a Rockefeller Fellow, and head of training at the International Service to National Agricultural Research (ISNAR) in The Netherlands. He also taught field courses in Thailand, India, Panama, and Mexico. Those who have a favorite photo or memory involving Marcotte are welcome to post it on the Facebook page of the Humphrey Fellows Program. The material will be forwarded to his family. Condolence messages may also be sent to Paul Marcotte's family, via his nephew, Joe Marcotte, at Jwmarcotte@gmail.com or to Joe at 7735 Baseline Rd. Mount Hood Parkdale, OR 97041. TAGAYTAY CITY, Philippines, 2 August—The Ifugao heirloom rice variety Dona-al was recently featured with other Filipino gourmet foods at the media launch of Discovery Country Suites’ Feast of Colours. The main event will be on 13-14 August. Food connoisseurs and bloggers got the chance to relish an array of delectable Filipino dishes, among which is Chef Jaja Andal’s Blue paella, a stimulating combination of seafood and Dona-al, a traditional rice unique to Ifugao Province. Chef Jaja dyed the heirloom rice using pea flower, an herb that also has therapeutic effects, to give it a delicate blue hue that added an extraordinary visual impact to her creation. Dona-al (a sub-variant of Tinawon) can better absorb the blue hue from the pea flower and is therefore an apt choice for the blue paella recipe, noted Dr. Rochie Cuevas, a grain quality specialist at the International Rice Research Institute (IRRI). The idea behind Feast of Colours is derived from the vibrant colors and vigor of Tagaytay City’s lush landscapes. Conceptualized by Discovery Country Suites’ Chefs Anthony Raymond and Rhea Sycip, in collaboration with guest Chefs Nancy Reyes-Lumen and Jaja Andal, the Feast of Colours highlights home cooking as an integral part of Filipino customs and traditions and accentuates the Philippines’ colorful array of delicacies. Having the heirloom rice recipes from the Cordillera Region in Discovery Country Suites’ Feast of Colours speaks of the successful collaboration of the Heirloom Rice Project with the players in the burgeoning niche market for these varieties. IRRI and the Department of Agriculture (DA) are always on the lookout for partners to ensure the survival of the region's rice culture and the revered terraces, in this case, through restaurants that offer heirloom rice. The DA-IRRI Heirloom Rice Project also safeguards the link between end-users and the farmers as demand for this specialty rice is expected to increase over time. The Blue paella was complemented with an equally delicious entrée from Discovery Suites’ roster of excellent chefs to create a feast of colors on the plate. Chef Anthony Raymond prepared hearty well-loved viands such as Seafood Bicol express, Crispy whole lapu-lapu, Duck adobo, and his take on Oysters Rockefeller for appetizers. Guest Chef Nancy Reyes-Lumen cooked Mechado paprika and Rodrigo’s roast, a recipe from the well-celebrated The Adobo Book that she co-authored. Aside from the paella, Chef Jaja also served a salad of Tagaytay flowers and greens, and crab paté. The desserts by Chef Rhea included Amadeo muffins and Avocado sponge cake. Heirloom rice varieties are already a big favorite among the clients and customers of Discovery Country Suites in Tagaytay City. In its Restaurant Verbena, Chef Celmar Ambida uses aromatic red-grained Imbuucan to produce Arroz loco, a paella-like creation that fuses the flavors of the heirloom rice, lobster oil with tiger prawns, clams, herb-baked oysters, sausages, crab roe, crispy chicken thighs, barbecued red-braised pork belly, salted duck egg, shaved queso de bola, and chicken fat croutons. Drs. Casiana Vera Cruz, Digna Manzanilla, Rochie Cuevas, Cyril Domingo, and Anne Marie Eligio from the Heirloom Rice Project attended the food festival media launch. The team mingled with the creators of the innovative heirloom rice recipes and shared information about the varieties. A Lechon roll is also available from the restaurant’s menu. Their version of the classic lechon kawali is served with Dona-al and with three different dipping sauces: pork liver, spiced vinegar, and pickled papaya. Eduardo Jimmy Quilang, PRISM project leader at PhilRice, sent his gratitude to the DA and project team members: “I congratulate the PRISM team for this award. Truly, they deserve this as one of the fruits of their hard work and sacrifices. I also commend the DA for their full support, and look forward to more from this project as it is very timely and of great significance to the country." Representatives from PRISM partner agencies who attended the awarding were, from IRRI, Laborte, Nancy Castilla, Arnel Rala, Joselito Villa, Emma Quicho, Ruvicyn Bayot, Jeny Raviz, Abel Callejo, and John Bethany Macasero; from PhilRice, Leonardo Marquez, Arturo Arocena Jr., Jesiree Elena Ann Bibar, Henry Cayaban, Michael Barroga, Janica Gan, and James Elwyn Leyte; from DA, Ronald Roces; and from DA-BAR Raymond Patrick Cabrera. PHNOM PENH, Cambodia, 28 July—Cambodian farmers are steadily adopting new climate-smart rice varieties and associated technologies. This was revealed during the annual review and planning workshop of the project, Accelerating the Adoption of Stress-tolerant Rice Varieties by Smallholder Farmers in Nepal and Cambodia (ASTV), attracting around 75 participants (photo above). The review and planning of the Cambodian phase of the ASTV project, funded by the United States Agency for International Development (USAID), took place the day after an observance of the 30-year partnership between the Royal Government of Cambodia (RGC) and the International Rice Research Institute (IRRI). Representing the Cambodian government during the ASTV project review were H.E. Secretary of State Ty Sokhun and Deputy Director General Mak Soeun, on behalf of H.E. So Khan Rithykun, director general for the General Directorate of Agriculture (GDA). “I am pleased that the ASTV project is focusing on developing and deploying high-yielding, stress-tolerant varieties to increase farm productivity and resilience to climate change,” said Sokhun. He also commended the strengthening of the local seed systems in Battambang, Siem Reap, Kampong Thom, and Pursat provinces in the Tonle Sap Region under the Feed the Future (FtF) Program. FtF is a global hunger and food security initiative of the U.S. Government. “IRRI is committed and engaged with the Cambodian Government to improve the rice sector and the well-being of Cambodian rice farmers,” said Matthew Morell, IRRI director general. He highlighted the impact in South Asia of recently IRRI-developed stress-tolerant varieties, which are now being delivered for evaluation and commercial use in Cambodia “We will ensure these varieties are made available to those who need them the most,” assured Morell. An overview of the project’s progress in Cambodia was presented by Dr. Uch Chantol, IRRI ASTV scientist in Cambodia, and Dr. Uma Shankar Singh, ASTV project coordinator in Nepal and IRRI representative for India and Nepal. Plans and activities for 2016-17 were reviewed after partners presented updates on their activities during the first year. 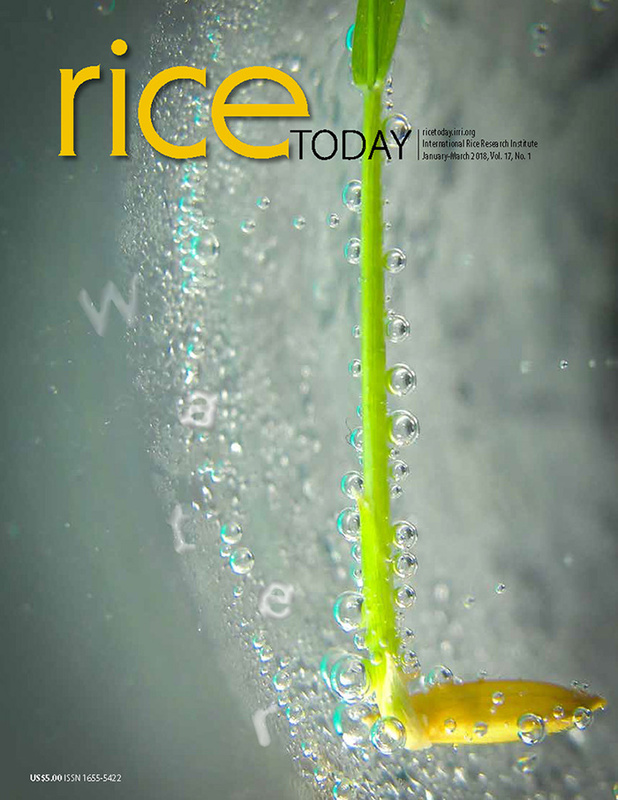 Reports on rice-based management systems for stress-tolerant rice in Cambodia, geographic information system (GIS), baseline and market studies, and monitoring and evaluation progress were presented by IRRI scientists Yoichi Kato, Nasreen Khan, Alice Laborte, and Srey Sinath, respectively. Activity reports were also presented by Director Ngin Chhay, Directorate for Rice Crops under the GDA, the Provincial Department of Agriculture (PDA) in the four provinces; and by Mr. Seang Lay Heng, deputy head, Plant Breeding Division, on behalf of Director Ouk Makara of the Cambodian Agricultural Research and Development Institute (CARDI). The occasion was also graced by Dr. Sang Lee, USAID Mission representative to Cambodia. 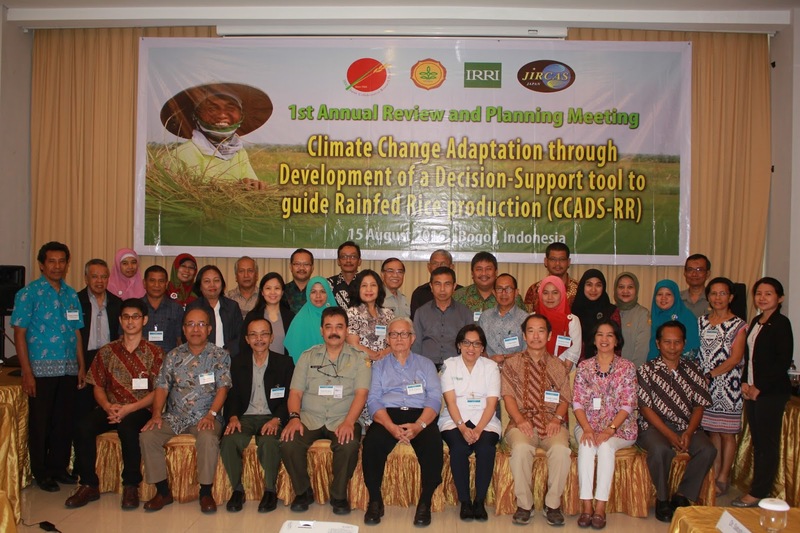 Lee took part in the workshop along with officials from the Ministry of Agriculture, Forestry and Fisheries, GDA, CARDI, PDA offices, seed companies, and development agencies. scientists,Abdel Ismail, Umesh Singh, and Uch Chantol. Abdelbagi Ismail, the overall ASTV project leader, thanked the participants from Cambodia, Nepal, and IRRI for successfully implementing the project. He was also pleased to announce that GDA has agreed to provide the IRRI-Cambodia office with more office space in the newly renovated GDA Building in Phnom Penh (photo at right). Bruce Tolentino, IRRI deputy director general for communication and partnerships, and Ngin Chhay, DRC director, lauded the strong partnership between IRRI and Cambodia and how the two are working together for the benefit of farmers and rice industry. Likewise, Mr. Julian Lapitan, IRRI consultant, thanked and acknowledged the active and immediate response of the institute’s Cambodian partners.